Good morning! Hope you are having a fabulous week so far! I just finished up a craft fair last weekend and I had a wonderful time, sold a lot of stuff and am soooo happy that it is behind me right now. I may do another one the last weekend in November but at least I have a little down time! 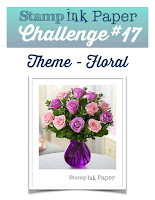 This week's SIP Challenge is Floral. How awesome is that??? I love love love flowers! I made a card a couple of weeks ago for my sweet friend Ginger using a retired Our Craft Lounge set called Dandy Days. On her card I used the dandelions but it had such a cool sentiment in the set that I knew I would want to use at a later time. Here's my card with that super cool sentiment! " I hope that we can we flowers in a world that sees weeds"... isn't that such a great sentiment! My A2 card base is Mossy Meadow cardstock. My next layer is Soft Sky Cardstock. I made a grass border in Mossy Meadow by using my Fringe Scissors. I also cut back into some of the fringe with my Paper Snips to make it look a little more realistic. My weeds and stems were cut from Mossy Meadow using a Woodland Branch die. I cut three of the branches and then cut them into a two or three pieces per branch and adhered them to the bottom behind the grass. The fence was cut in Smoky Slate Cardstock with my MFT Chicken Wire cutting plate. I adhered just the edges to the Soft Sky layer with 2-Way Glue so that I could pull out some of the grass, weeds, and stems through the fencing. Ok, so I know that chicken wire runs the other way but I really wanted my card in landscape position so my chicken wire was apparently installed incorrectly by the fencing crew! Just go with it! lol The Petite Petals flowers were stamped in Daffodil Delight onto Whisper White Cardstock and punched out with the coordinating Petite Petals Punch. I curled the leaves with my Bone Folder to add some dimension and added a Rhinestone Jewel in the center of the flowers. The flowers were attached using glue dots. The sentiment was stamped in Mossy Meadow onto Whisper White and backed with Mossy Meadow Cardstock. Both banner ends were cut with the Banner Triple Punch. I really love the way it turned out and hope you did too. and link up your own floral card! Tina, Love your card! flowers are so pretty! 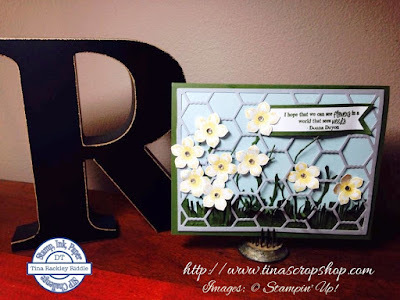 Ok, so now I know I need to get the MFT chicken wire die, that is so darned cute! And that OCL set is wonderful, great sentiment. Love the design Tina! So pretty, Tina! I love the chicken wire die, too.